For thirty eight years, I always prided myself on the fact that I had never, ever been fired from a job. Ever. I was always the one who left a job. Truth be told (especially when I was in my twenties), the going would get tough, or I would get bored or worse, if I felt slighted in the tiniest bit, I would simply put in my notice. Leave. Find something new. If I got bored, I’d leave. If I got frustrated, I’d leave. If my sales sucked or if I didn’t get that promotion, I’d leave. I did this throughout my entire twenties. When I turned thirty, I gave up on J.O.B.s and started working freelance. I was my own boss and I got to choose which clients I wanted to work with. If I didn’t get a good vibe from someone, if they ticked me off, or if I simply didn’t like working with them, I would just stop returning their calls when they requested me. I held the power. I made the decisions. I ran my own life. The thing about that type of control though, is that it can seriously affect your work ethic. If you think about it, if I’ve never been fired, then that would make me a quitter. Of course there are positions that, um yeah, you have to leave. If they are taking advantage of you, if the situation is hazardous to your well being, etc. By all means, quit. 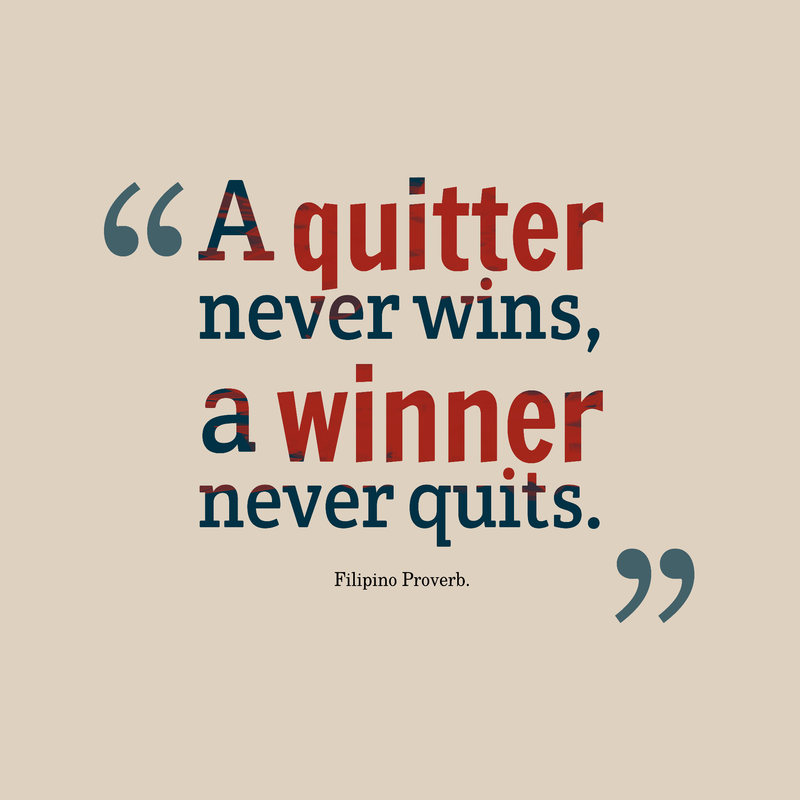 But in each of my situations, I simply quit, gave up. Looking back, I see that I was indeed a quitter. I didn’t realize this though until I recently got fired for the very first time. Let’s be honest, I was indeed on the verge of quitting. I loved the job. I loved the company. But what they needed and what I could provide just didn’t fit together. I was feeling very frustrated that what I was providing to my boss wasn’t working for them, yet he was still paying me for producing the work that I felt was “useless”. I felt bad. I felt like he was wasting his money. That’s a feeling I really hate. And it was neither of our faults. I’m a great “key”, I’m just the wrong “key” to fit in the company’s “lock”. I was feeling guilt, frustration, and those of course led to anger and a desire to leave. But I didn’t. I kept at it. I pushed through the frustration. I came up with even more ideas, more suggestions, more content. But still, it just didn’t work. We weren’t the right match. So when I got an email from my boss asking when would be a convenient time to talk to me, I knew what he was going to say. I was getting fired. My initial reaction was anger. WHAT?!? ME??? FIRED??? WTF!!! But after a bit, I realized that my being fired was a good thing. It was the first time ever that I was not the one to give up. I pushed through it. I kept at it. I didn’t quit like I had so many, many other times. Am I relieved though that I’m no longer employed at that company? Yes, absolutely. Like I stated, we just weren’t the right fit. I still adore the company and we have a tremendous amount of respect for each other. But I’m also very proud of myself for not giving up. The next time you are in a tough spot where you would normally give up, try and see if you can stick it out a little longer. It doesn’t have to be forever. Because by sticking it out, you never know what you might be able to accomplish. Even if it’s just knowing that you can handle more than you ever thought you could. The universe works in mysterious ways. I’ve struggled lately trying to figure out “what I wanted to be when I grew up”. I guess it all started in high school. I wasn’t quite sure what I wanted to do with my life and so I took the ASVAB test which tests your various aptitudes and tells you what areas of work you would do well at. Unfortunately for me, the results said, “You’d do well in all subjects”. Well that sure narrowed it down. College was the same. I decided to settle on a business degree specializing in the service industry as all industries require people who have a background in business and most require interacting with people. Still wasn’t sure what I wanted to do with it, but at least it was a start. I bounced around genres during my work life as well. I worked for department stores, rental car companies, staffing companies, cosmetics companies, etc. And while I was good at all of them, nothing felt quite like the right fit. Even working freelance didn’t feel like the right fit. I always felt fake, a phony, like I didn’t fit in. Recently though, I started thinking about the things that really make me happy. The things that when I do them, they don’t feel like work. And I was able to narrow it down to two succinct things: digital communications and beauty. I know that tech and lipstick don’t always seem to go together, I love being on the computer creating things that impact peoples emotions and lives, and I also love putting makeup on women and impacting their emotions and lives in that way. It was a hard decision to narrow down my priorities and an even harder decision cutting/limiting ties to those projects that don’t align with those. 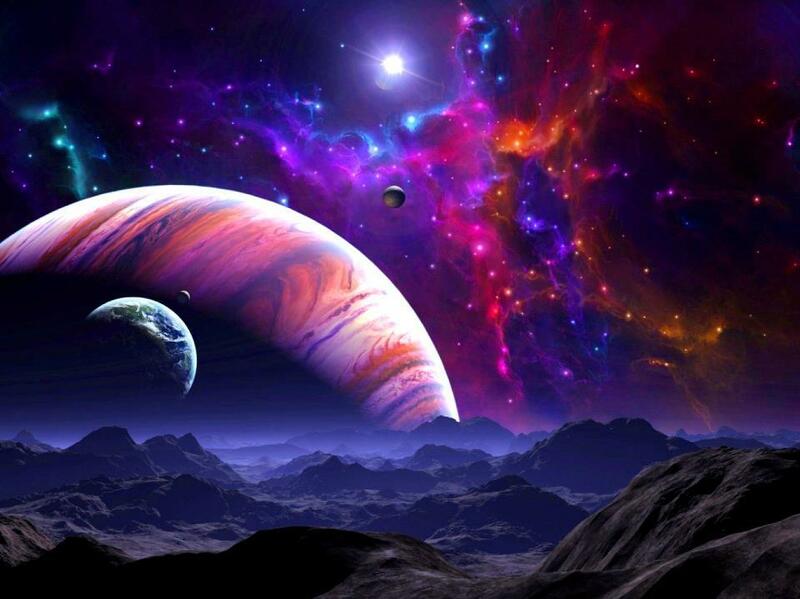 But the universe has a very weird way of working. I had made my decision and redirected my focus, and literally the next morning I was headhunted for my dream job! Starting Monday, I will be working for an aesthetic surgeon. I get to handle all of his digital communications-social media, web site, blog, newsletters, etc. His wife owns a skincare and cosmetics company, so while I work in the office, I still get to do makeovers on women. I get to combine both things that I love to do. I also get off of work in enough time to pick my kids up from school and then I get to finish my work day in front of my laptop at home. To top it off, turns out I had met his wife years ago through a fashion organization I belong to. 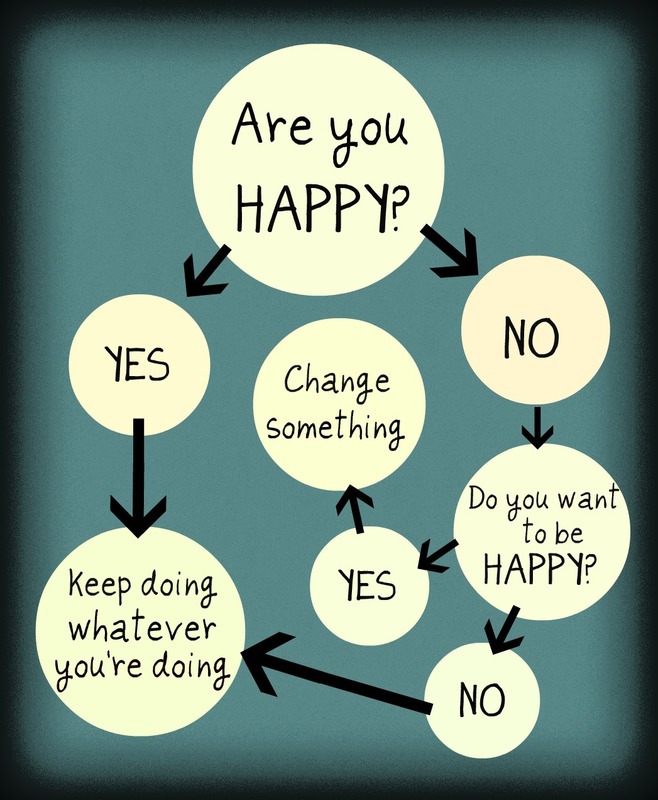 So, when you feel like your are floundering around aimlessly, take a long hard look at what makes you happy. You never know where it will lead you. This photo was on Facebook today and it just really resonated me from a personal and professional standpoint. I seem to be so very busy lately with all sorts of projects, but which ones really speak to me? I work freelance to be able to have the control over my business and my life. The kind of freedom that people stuck in their cubicles dream of. Am I being true to that? Are you true to yourself? That’s an interesting question. It should be the kind of question we all ask ourselves and then have the luxury to be able to live. Sadly though, many either can’t, choose not to, or even worse, don’t even know that it’s an option. I fortunately have the option and can, but am I? The great thing though about life, is you get a choice. No one can make you do anything. The “gun to your head” scare tactic…you still have a choice. “I had no choice” is never an excuse. And I’ve decided to make some choices to help me get back to being true to myself and what my goals are in my career and my life. They are not easy choices. Nothing really truly great in life is an easy choice, an easy decision. But you know it’s a great choice, a great decision when once you make it and act on it, you feel a release off your shoulders, a spring in your step, an excitement each morning when you awake to face the day ahead. I have an extremely odd way of making those tough decisions. I use a Magic 8 Ball. Yes, that’s right. I ask my question, swirl the ball around and let it reveal the answer. BUT, I don’t look at what the Magic 8 Ball says for my answer, I get more philosophical than that. When I read the answer, I focus on my immediate gut reaction. Do I feel relieved? Or do I feel like I was punched in the stomach. That first, immediate reaction is sub-conscious and can’t be faked. By honing in on that, it allows me to make those decisions that I know I need to make, but I keep rationalizing both sides of it. Regardless of the strategies to help make choices, important decisions in your life, they must be made. Waiting in limbo for too long may make your life stand still, but time is still passing, time that you can not get back. Time spent worrying, rationalizing, stagnating. This photo had me thinking about the decisions that I’ve had to make recently that I had been stagnating on. Those choices that I need to make to get back to who I am, to be true to myself. Those choices that once made, will drastically improve my personal and professional life because when you are living and working on your purpose, you feel invigorated, alive and most importantly, happy. Making a Postive Difference in Someone’s Life..
Years ago (heck, might even be close to a decade ago), I did a weekend seminar designed to help you find your purpose in life and then use that purpose to make your dreams come true. Hokey, I know, but I’m a self-help nut-job. 🙂 After the first full day of classes, I spent the evening really reflecting. Journaling, just letting whatever come out. From there I reviewed what I had written when it just hit me…my purpose in life, what truly makes me happy. I think that’s why I can’t focus my efforts in work at just one genre. Lots of things that I can do make people happy. When I put makeup on someone or teach them how to make themselves beautiful, it makes them (and me) happy. Some of my most favorite customers are the ones that when I finished their look, I couldn’t get the mirror out of their hands. They were so happy with how they looked, that they actually started tearing up. I love that! In my social media and digital communications work, I try to find fun and humor in everything. With the explosion of tech communication, we are constantly bombarded by news, horror stories, disasters, and drama. Unfortunately, the drama sells, it goes viral, it’s what clogs up your newsfeed. And it’s a major downer! I can’t stand that I scroll and see a natural disaster somewhere, another scroll and I see a man-made disaster, another scroll and children are missing and/or abused, another scroll and there’s racial, sexual, financial hatred. I can’t stand it. So I made it my mission to try to change that. I try to make my posts and articles uplifting, inspiring, and always a tiny bit (ok, some more than just a tiny bit) humorous. Sometimes I lose track of it all, but then something happens, someone says something and then I’m reminded of the power I have over other people. A great friend of mine revealed that she can’t read my posts at work anymore. I’m serious! She said it’s because she laughs so crazy, so hysterically that she either spits out whatever she’s eating or drinking all over her charts (she’s a nurse) or she ends up having people run into the room to see if she’s ok. And I love that! She’s come to expect that from me and she knows that if she ever needs a pick-me-up, then I’m right there, at any hour of the day, on her smart phone. I guess you could say that I’m a little bit of a therapist as well. Taking people when they are having a rough time and making them feel a little bit better, give them a little more hope. A good friend of mine just lost her job. That can be devastating in this market especially when you add into the mix that she is a single mother and her car is not working right now. Being able to help give someone hope and even make them laugh a little helps with the healing process, helps with the moving on. Hello, my name is Jeanette and I’m an organizing freak. Yes, I admit it. I can not function in chaos. I’m a planner as well. I have to know all my steps, my master to-do list, my map so-to-speak. I have always been that way and I am finally comfortable enough and proud to say that I will always be that way. We all operate and function in different ways. Just as people learn via different methods, people can also thrive (or not thrive) in various environments. For years, nay almost a decade, I thought that something was wrong with me, on why I couldn’t succeed in doing things, why others succeeded when I didn’t, why I consistently felt stressed out and not myself. Part of it was those people that I thought were my mentors and while they were (and still are) amazing people which I learned a lot from, they consistently told me one thing over and over again which seriously hindered me…they told me “quit planning and just do”. While that may work for most people, I am certainly not most people and it definitely did not work for me. And it wasn’t until recently that I realized that. I was bumbling along in my career. Trying to succeed in this, trying to succeed in that, with zero luck. I was attempting the “just do”, but I didn’t feel like myself and when you don’t feel like yourself, you definitely lack self-confidence. And when you don’t have self-confidence, well…everyone can tell. I didn’t feel strong or sure of myself. I constantly second-guessed myself. I consistently let fear of the unknown get the better of me. And I think that the biggest thing for me is the fear of the unknown. Heck, I get ridiculously uncomfortable driving in new places unless I’ve reviewed the route via Google Maps at least a half dozen times. I need to know the route, the back up route and the back up route for the back up route. The same is true of my life. I make plans and then I play devil’s advocate to come up with a few back-up plans just in case. I’m constantly joking around that if you create a back up plan, then you won’t need it, but if you don’t have a back-up plan, then that’s when you’ll need it. Yeah, I joke about it, but I really truly believe it to the core. It calms me, it soothes me. Knowing I have a plan B and a plan C, allows me to relax about plan A, not worry so much about it, have more self-confidence about it and you know what? I very rarely have to use plan B and I can’t remember the last time I’ve had to use plan C. It’s just so comforting to me knowing that they are there. And that works for me. It gets rid of a lot of the chaos (I’ll never get rid of all of it, nor would I want to as chaos does provide that air of excitement), but most importantly it leaves me with a calmer mind that allows me to succeed in my project du jour. Now for those naysayers who are thinking to themselves (or even out loud), “Sure, you’re a great planner, but plan all you want, nothing happens until you do something”. Here’s where I take my planning to the “doing” level. Once I have a gameplan, I set it up into teeny tiny, succinct to-do lists. I mean like ridiculously tiny and succinct (google such-and-such to brainstorm, pick top 3 ideas from google brainstorm session, create a gameplan for each top 3 ideas from google brainstorm session-yes, those have been actual to-do items for me). Then I take those to-do items and add them into my calendar task list for the appropriate day that it should be done on. If a to-do item doesn’t or can’t have a due date, then that means that I need to re-evaluate it in my overall gameplan and tweak it to where it can have a due date. Everything in my gameplans ultimately have due dates. That’s how I can take my planning self and turn it into a doing self. If it’s a project that take two weeks to complete, then I break it down into teeny, tiny bites/tasks that can each be accomplished in one day and then I add all of those to my task list. Sure, I end up having 40-50 tasks each day to do, but you know what? Over half of those tasks take 5 minutes or less each. And I’m telling you, you definitely feel like you are having a successful day when you are constantly checking off things as completed. And lots of little baby steps can take you really far. 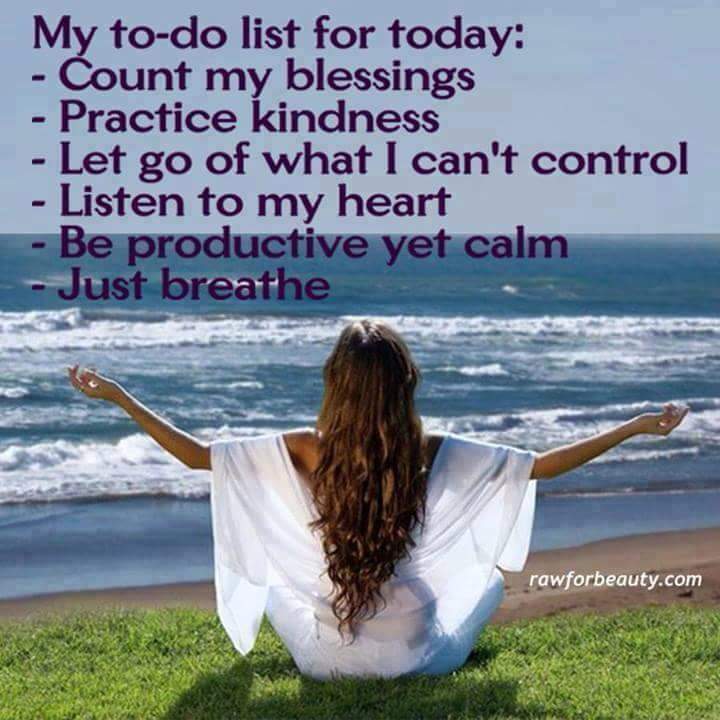 Creating those task lists by due date also help clear my mind in that I only worry about what is on my list for today. I don’t worry about tomorrow or the next day or next week. I don’t have to worry about forgetting something, because as soon as I think of “something that I have to make sure I don’t forget”, I add it to my calendar task list and then I’m free to forget about it until it conveniently pops up in my list on the day it’s due. It’s refreshing and limits my daily stress. Now, one extremely important thing that I have learned and 100% respect is that not everyone operates like I do. Where I try to avoid chaos, there are others out there that thrive in it, that love it, that fuels them. 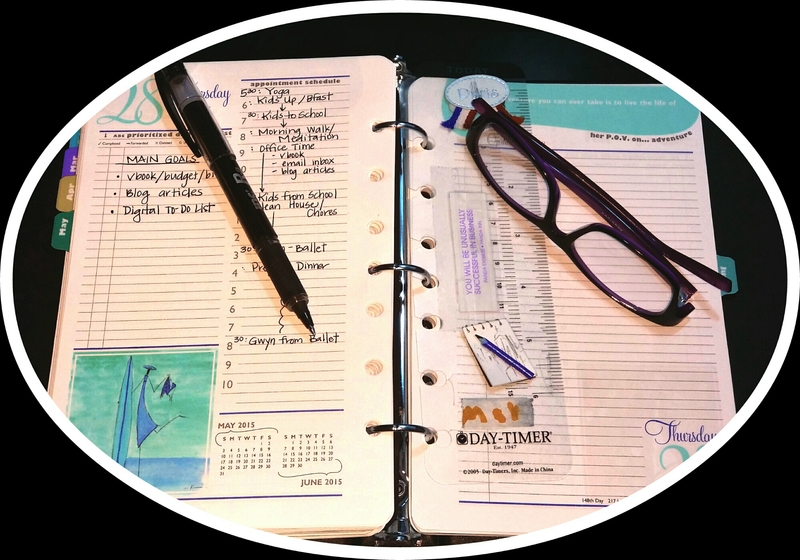 There are those people who just the thought of a to-do list freaks them out. And it’s very important to know that that’s ok! We all function differently in different ways and in different environments. The key to success, especially when working in groups, is to understand that the way that you do things is not the way that others are going to want to do things. It’s ok to allow each member of a team to do things their way as long as they get to the agreed upon final product. Just as Google Maps has various ways to get somewhere, the same is true of projects. I guess what I’m trying to say is to embrace who you are and how you work while respecting the way others work. Tolerance like in all areas of life is important. Be tolerant to others but also be tolerant to yourself. That’s the one we typically forget. Let others be themselves, but don’t forget to be yourself as well. Lately I’ve been doing an awful lot of bartering and I’ve got to say…I almost prefer bartering to getting paid cash money! With cash, I use it for things like buying groceries, paying the electric bill, putting gas in my car. And while I enjoy eating good food, having lights on at night and driving my kitty cat around (I own an old Jag), I don’t get to do very much fun stuff for myself. Maybe it’s the “mom” in me that I want to spend my money on “smart” things for my family, but sometimes I just want things for myself. I work hard, I deserve it. A happy mom/wife equals a happy life, right? I’m really open to just about anything! I think that we can all get a lot farther along in our lives and careers by reintroducing the barter system. Granted we still need paying gigs to be able to pay for our electric bill, but why not barter with our friends, colleagues and neighbors for other things? What things do you like to barter for? Got anything you’d like to barter with me for? There is absolutely nothing UNclassier than a grumpy grumpster. Bad, negative attitude, bitchy even. It’s just so not classy. But we all get that way some days. It’s normal, it’s natural. We do so many things throughout our days that if we don’t take a little time to destress, it can drive us absolutely bonkers. Some days we just need to “check out” for a while and yesterday was most definitely one of those days for me. I’ve been handling and running so many different projects lately (ones that I’m excited about! ), but between those, a hubbie, two kids, and the not-so-fun symptoms of peri-menopause, I will admit it, I was bitchy yesterday…and the day before that…and if we’re counting, the day before that too. You get the idea. So I decided to take a much needed break last night even though my to-do list was horrendous, I was going to do no one any good unless I decompressed and took some time for myself. I decided to do a tech-free spa night. There’s no fabulous pictures of my spa night because I went tech-free for the evening-no emails, no Facebook, no television. I had a pile of fashion magazines waiting to be read (ummmm…one of them was from last November…oops). I also had a complexion that was feeling worse for wear. So I gave myself a DIY facial. I removed my eye make-up and washed my face. Then I put on a glycolic peel mask (the one from No7) and waited a little bit longer than what they initially said, ok, a lot longer, but who’s counting? After washing it off, I put on a super hydrating mask from Nuxe (the 24hr hydrating one). After letting that sit, I rinsed it off then went to work putting on my treatments. I’m really loving the new L’Oreal Revitalift series-specifically the hyaluronic acid serum and the regular serum. I used the hyaluronic one where I needed it so basically everywhere from my nose down. The regular serum I put everywhere else. I then topped everything off with a heavy duty shea butter cream from No7 (the one with the rose top). I then plopped myself in my recliner with a cocktail, some chocolates and my fashion magazines. All, in all it made for a fabulous night! This morning I woke up to the softest skin I’ve had in a REALLY long time and I felt motivated to start tackling my to-do list again. Sometimes we just need to step away from things for a few hours and regain ourselves back. What do you like to do to step away and recharge? 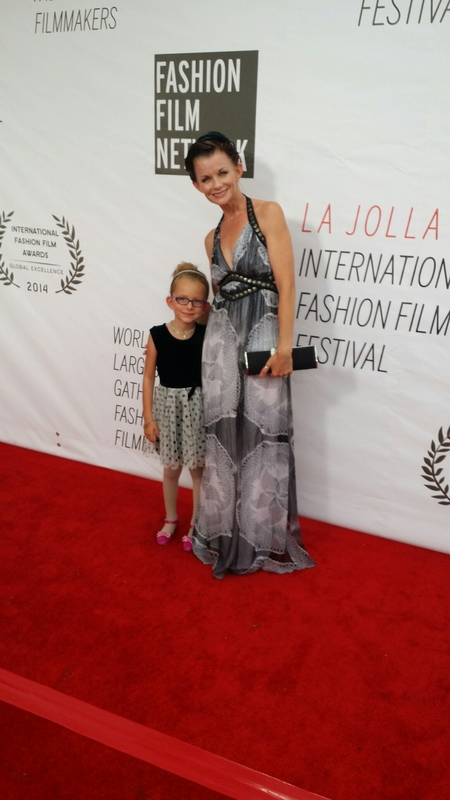 Last weekend I got the honor of attending the 5th annual La Jolla International Film Festival with a blogger’s pass. Sooooo very excited about this! But when you try to live your life “classy on a budget” and are going to be surrounded by people wearing Chanel, Dior and Prada as well as one-of-a-kind designer outfits, it honestly can make you a little intimidated. But I knew I could pull it off. I just had to be a little bit creative. Ok, maybe a lot of creative. But with the compliments I received throughout the weekend, I say I rocked it. This was opening night. I bought the jumpsuit at Ross on the Las Vegas strip for under $20. I wanted it super flowy since I was attending a summer event so I went with a size 8P even though I’m a 0/2 (also it was the only size they had it in and I loved it!) The shoes are Prabal Gurung for Target purchased on sale for about $30. The handbag and belt were also Target and purchased YEARS ago. I think I paid $20 for the belt and around the same for the purse. The jewelry is all from the swap meet here in San Diego. The ring and bracelets are just simply, inexpensive costume jewelry. The earrings though are vintage from the 1950s. I also bought them from the local swap meet but bought them from the little old lady who originally owned them. So I think total for the outfit was under $130. Second day was seminars. This is an amazing black vintage dress given to me by a good friend. It belonged to her mom, but didn’t fit either of them anymore. My friend knew that I would give this dress new life and so she gave it to me. The shoes are from the local Goodwill store for $5.99. That’s right, FIVE BUCKS!!! That killer necklace is once again from my favorite store, Tar-jay, and I bought it on clearance for $10. The shades are from the Dollar Tree. Total cost of outfit? $17 baby!!! Day three: seminars. 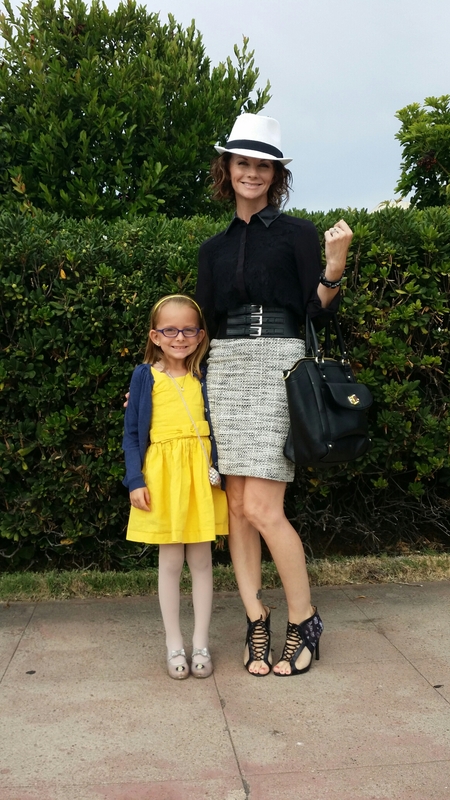 And I brought my little fashionista in training with me! On me: hat-swap meet for $7, Shirt, belt, shoes, purse from Target for $20, $20, $30, $40 respectively (Prabal, Mossimo, Prabal, Mossimo respectively). Skirt is Bebe from a thrift shop in Temecula called Ritzy Rags for $25. Cost of my outfit: $142 but the belt is the same one that I wore on day one. I actually repeated accessories at the same event!!!! Final day of the event: red carpet. The shoes which you can’t see in the photo are the same ones I wore opening night-Target for $30. The purse was a gift. The dress is Bebe from once again my trusty local Goodwill and I snagged it for a whopping $14.99. Total cost for outfit: $44.99. So, how’d I do? Not too shabby if I do say so myself. This event really forced me to be creative and to look at my wardrobe in a completely different way. What do you have in your closet that you can get super creative with? Just a quickie as I am on vacation. In Vegas. At the pool. With a cocktail! Bien sur! But wanted to show how you can still look fashionabulous at a swanky pool yet not kill you pocketbook. All it takes is a little creativity/thinking outside of the box and knowing where to shop! One of the classiest things (and not to mention budget-friendly) is cultivating great relationships with people. It doesn’t cost you a thing and yet it can bring you so much! I have a colleague that I met a couple years ago. I had hired her as the hair/make-up artist for a project I was doing and loved her from the get-go. Through the years, anytime that I had a project in which I needed assistance, she was always the first person on my list. She’s super sweet, extremely reliable (something that is sadly rare in today’s age) and not to mention obscenely talented! How talented might you ask? Check it out! Utter fabulousity! Right!!! My boring brown hair was completely functional (it covered my grays) but seriously lacked in the form part of it. I mean, come on! I work in a creative field! Shouldn’t I have creative hair to match??? She touched-up my roots and then used the bayalage technique to handpaint in luscious caramel highlights. Then she got to work chop-chopping away at my snooze-fest of a bob. First up was some serious texturizing all around. I wanted to keep a bunch of my length, but desperately needed a new lease on hair. She finished the cut by adding some great bangs. I don’t know why I always poo-poo bangs. I look pretty darn good in them! Now, here’s where great relationships come in handy! We negotiated…she did my hair and I cooked her a super yummy, healthy dinner and gave her two large bags of produce fresh from my backyard in exchange for a discount on my services. If you have great relationships with people, then this sort of thing is possible. But if you have a bad reputation in business…then forget about it! Your reputation and business relationships are EVERYTHING in life. And it doesn’t cost you anything to maintain positive ones. Always strive to do the right things, treat people the right way. It most definitely pays off. In this instance, I got not just good hair days, but GREAT hair days! 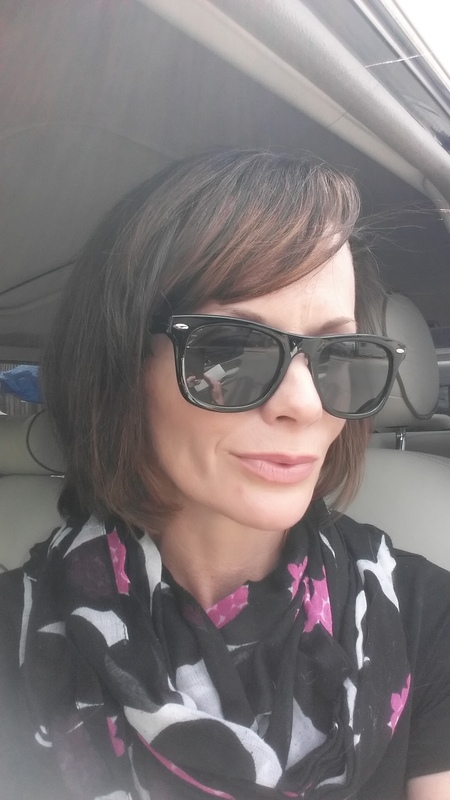 And my super cool shades…Dollar Store BABY!! !